The GIT Award 2015 One to Watch, Louis Berry. 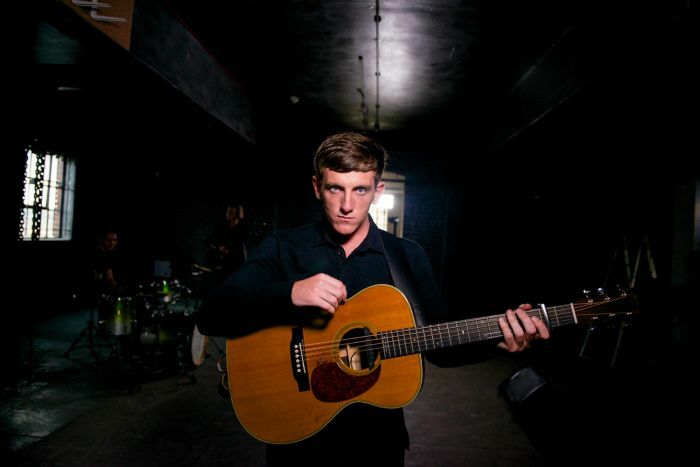 Fresh from being crowned the GIT Award 2015 One to Watch, Louis Berry chats to Getintothis’ Sean Bradbury about ambition, influences and Liverpool. It’s fair to say Louis Berry makes a memorable introduction. Those lines, delivered through rasping, burnt and gently murderous vocals which seem steeped in experience way beyond a mere 23 years, signal the start of .45 – the solitary song he has released so far. And he doesn’t hang about. .45 has already been picked up and given airplay by Zane Lowe. Even more impressively, Louis has played two gigs to date and signed a contract at each of them; a publishing deal following an explosive BBC Introducing set and recording terms after lighting up The Loft at the Arts Club. While Louis keeps his cards pretty close to his chest – probably a wise move if you want to take on the Bishop of Rome – his ambition is evident and his mission statement noble. Louis explains: “I’m quite daring in my nature. I like to compete and strive to be the best. Everyone can to some degree, in different ways. I’m opposed to a lot of things as well. I like to voice my opposition. I hold very strong beliefs. I feel like music these days is very cheap, very bland. For me it’s to try and put a bit of life and meaning into it. Some depth. “I don’t have an agenda. I don’t have one specific goal. There are a lot of problems. I can raise awareness of them and I’d be willing to do whatever it takes to solve them. I’d like to stand next to people – not in front or behind him but next to them. Try and bring some truth to what’s going on. What was his musical diet growing up? When the conversation inevitably turns to ‘influences’, there are some unsurprising mentions – but with interesting reasons behind them. “It’s varied,” Louis says. “From old rock and roll to rap. A lot of people say, ‘what’s your favourite kind of music?’ I don’t think that’s a question anyone can answer. It’s just whatever really touches you. Whatever you’re looking for I think you’ll find within music. It’s just getting harder to find it these days. “A lot of the artists that I really like are dead, but they went to a lot of depths in their music. I value that. It is there today, but I can’t find it in abundance. I want to create a movement that’s different. That’s not comparable to anything else. There is metre and melody in everything Louis says, and the sense that he is determined to be his own man shines through with passion and purpose. Louis has lived in Liverpool all his life – “Born in Kirkby. Moved around a lot. To Anfield. To West Derby. Spent a bit of time in Norris Green, Croxteth, Cantril Farm and Huyton” – and while the city hasn’t always treated him right, it has only served to harden his resolve and sharpen his focus. He reveals: “When I tried to get into music I was shunned. A lot. Maybe I didn’t look right. Maybe my accent was a little bit too strong. Certain bars I went into, there were no Liverpool artists in there and I was treated with disrespect. I tried to get up at open mic nights and I was refused. That really pissed me off but I went home and thought to myself, ‘you know what, I’m going to come back with something that you can’t deny, you can’t refuse. And you can keep your open mic night’. “I was getting denied the ability to play in my own city by someone who wasn’t from my city. I don’t think a lot of Liverpool artists are taken seriously at the minute. I feel like there needs to be a re-emergence of intent and attitude. We’ve shown we’re the best at it in the past and we’ll be the best at it in the future. Louis has recently been down in London recording more tracks ahead of a first full release. Fans of .45 can expect to hear other tunes like it – and plenty more besides. “There’s a lot of excitement in these new tracks“, Louis says. “Some of the uptempo ones really get you going. It’s a new form of rock and roll I believe. But it varies. I’ve got songs that are a lot slower. I won’t put a genre label on them but they have a lot more depth into emotional frames of mind. I play with a band. Great set of lads. Amazing players. What brings that ‘special’ quality to his sound? And where does the inspiration for his songs come from? Louis explains: “I believe it’s just given to me and I just translate it and try and give it the best form. I don’t know really. But I do know. It varies from time to time. Sometimes I could sit there listening to people speak, judging the emotions that I see from them and try and describe it. If .45 is anything to go by and if he is true to his words, there are sure to be scores of converts each and every time Louis Berry steps up to the pulpit. Louis Berry will be performing at The GIT Award 2015 on Saturday April 4 at The Kazimier. You can find ticket details here – and LFC TV on Thursday April 2.